This Perfect canister is the same old style vacuum that used to be made by Electrolux. You may remember seeing this machine in your home where you grew up. The all metal housings are made very well and allow for years and years of use and abuse. If this vacuum was big enough you may have been able to use it as a bomb shelter. This vacuum pulls an amazing 125" of water lift, making it competative to most central vacuum units. This Perfect canister is one of the few vacuums on the market today that offers this much suction. The 15" wide power nozzle will eat pet hair like its nobody's business. This vacuum also includes an automatic shut off system on the power head that increases the belt life allowing it to be called a lifetime belt. If anything is vacuumed up in to the power head the power head will shut of to protect the belt. Then all you need to do it push the reset button and you are back to work. * Soft horse hair combination dusting/upholstery tool. * Air-driven stair / upholstery tool. * 12-inch wide soft horse hair bare floor tool. 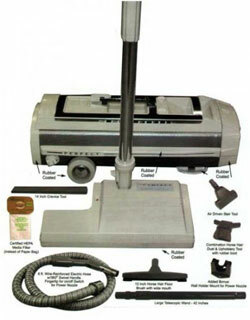 You will have the same type of quality and durability many have had for years with their old Electrolux vacuum. Perfect have made many improvements including the new HEPA filtration style Electrolux bag, which will filter more dust and allergens then the standard paper bags that usually came with the Electrolux. This vacuum is packaged with a 2 Year Parts and Labor Warranty. - Metal tank construction for durability and long life. - 6-foot hose with 360° swivel handle. - Rubber wheels on canister and protection bumpers all around to protect floors and furniture and anything it may run into. Copyright 2010 Vacuum Depot. All rights reserved.